The LASP Rocket Program is currently supported by the NASA Solar Dynamics Observatory (SDO) mission in order to calibrate the SDO EUV Variability Experiment (EVE). Built and controlled by LASP, the EVE instrument measures solar extreme ultraviolet (EUV) irradiance, or the energy from the Sun that heats most of Earth’s thermosphere. EUV data help scientists understand the Sun’s influence on Earth and near-Earth space, including potentially hazardous space weather phenomena like solar wind. 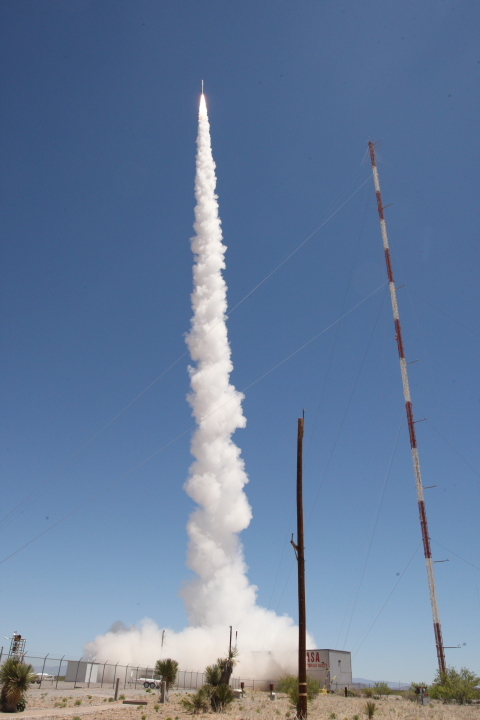 Sounding rocket launches are planned annually throughout the SDO mission’s five-year duration to ensure the accuracy of EVE-collected data by measuring any natural damage to the EVE instrument in space. SDO launched on February 11, 2010; the first underflight calibration flight was on May 3, 2010, the second flight was on March 23, 2011, the third flight was on June 23, 2012, the fourth flight was on October 21, 2013, and the final flight during SDO’s prime mission was May 21, 2015. During SDO’s extended mission there was a sixth flight on June 1, 2016, and a seventh calibration rocket flight on June 18, 2018. The LASP rocket payload was rebuilt in 2006 to better accommodate the SDO EVE channels. This rebuild included larger rocket skins and a new control section. San Marco: A LASP/NCAR rocket payload was used during the Italian San Marco satellite program to provide a calibration for its solar EUV irradiance instrument in 1988. Solar Mesosphere Explorer (SME): Launched in 1981, SME investigated the processes that create and destroy ozone in the Earth’s mesosphere, which is a layer of the atmosphere extending from the top of the stratosphere to about 50 miles. The LASP Rocket Program provided routine calibrations for the SME solar UV irradiance spectrometer. TIMED Solar EUV Experiment (SEE): The LASP Rocket Program supports the Thermosphere, Ionosphere, Mesosphere Energetics and Dynamics (TIMED) mission. Launched in 2001, TIMED studies how the Sun and human activity affect the regions where the Sun’s energy first becomes part of the Earth’s environment. 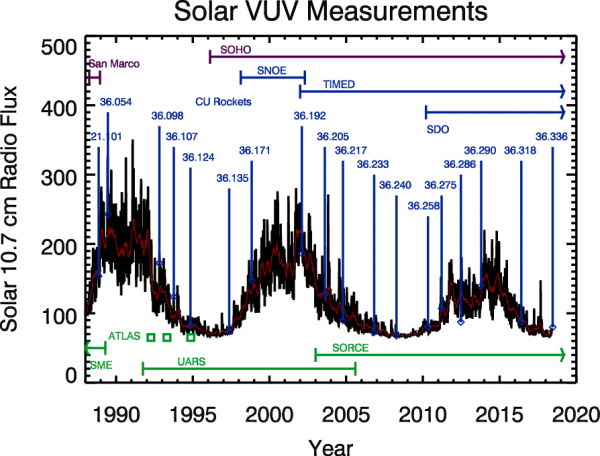 The LASP-built SEE instrument is investigating the highly variable solar extreme ultraviolet radiation.